Howard L. Levine, M.D., F.A.C.S., F.A.R.S. Howard L. Levine, MD is one of the pioneers in the development of advanced nasal endoscopic diagnostic techniques, functional endoscopic sinus surgery and advanced applications of radiofrequency energy for nasal and sinus disease. Listed in The Best Doctors in America, Top Doctors in Cleveland, Consumers’ Research Council Top Doctors in America in Otolaryngology, Dr. Levine is world-renowned as an expert in nasal, sinus and breathing disorders. Dr. Levine is a consultant for some of the most advanced medical companies providing unique and effective treatments for sinus and breathing disorders disease. Dr. Levine is a pioneer in the development of the concept of "minimally invasive sinus surgery" and, along with his staff, works tirelessly to provide timely, state-of-the-art and appropriate help so patients actually feel better. 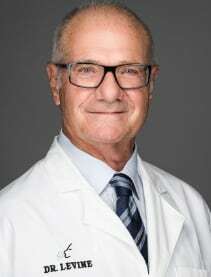 Dr. Levine, Director of the Cleveland Nasal-Sinus & Sleep Center, he is on the adjunct staff of the Head and Neck Institute of the Cleveland Clinic Foundation and is the former head of the section of Nasal and Sinus Disorders of the Cleveland Clinic Foundation. A graduate of the University of Pennsylvania and Northwestern University School of Medicine, Dr. Levine trained in general surgery at University Hospitals of Cleveland, Ohio and specialty training in otolaryngology at Northwestern University Medical Center. Dr. Levine is a fellow in the American Rhinologic Society and served as its President (2006-2007). He is also a fellow in the American Academy of Otolaryngology-Head and Neck Surgery, the American Academy of Facial Plastic and Reconstructive Surgery, the American College of Surgeons, and the Triological Society. Dr. Levine has written and lectured on nasal endoscopic diagnostic techniques, functional endoscopic sinus surgery, and advanced applications for managing nasal and sinus disease. Dr. Levine has been an investigator in minimally invasive sinus procedures such as Balloon Sinuplasty™ and the use of office procedures to manage nasal and sinus problems, including snoring and sleep apnea. Dr. Levine is a pioneer in the use of such as the Pillar Implant™ for snoring. Dr. Levine serves as a consultant to several companies that specialize in the development of pharmaceuticals and instrumentation for nasal, sinus, and breathing disorders. 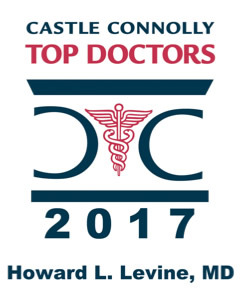 Dr. Howard Levine Honored as 2017 Castle Connolly Top Doctor!